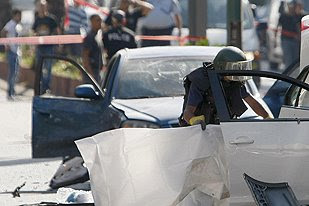 Israeli ‘Mafia’ Boss Assassinated.Don Alperon was said to run Tel Aviv’s third largest crime family.One of the leading figures in Israel’s mafia-style organised crime gangs has been assassinated in a car bomb attack. Yaakov Alperon, known as “Don Alperon”, was driving his saloon car through a northern suburb of Tel Aviv when the vehicle was torn apart by a huge blast.Two bystanders were also slightly injured in the explosion, one a 13-year-old boy waiting at a bus stop.The attack has raised concerns that an Israeli mob war could be about to spin out of control.Little was left of the car after the explosion, which was apparently set off by remote control just before midday.Don Alperon’s body was seen slumped over the steering wheel.A police spokesman said, with understatement, that the security forces were now assessing the situation to see what would develop in Tel Aviv.This is the latest and most serious attack in an Israeli mob war which some fear may once again be coming to the boil.That is worrying because of the lack of concern shown by the mobsters for civilian casualties.Anti-tank missiles, grenades and bombs have all been used in Israeli mob hits.In one failed attempt to kill a rival gang leader in 2003, three people died when a bomb explosion hit a passing bus.In another attack, a whole building was destroyed while the intended target, another mafia leader, walked away. Don Alperon was a flamboyant figure known for dating famous and beautiful women from Israeli show-business.He was said to run Tel Aviv’s third-largest crime family.If Tel Aviv is in for another period of bloody rivalry between the city’s mafia gangs, residents will want to know if the police are capable of stopping it.The Israeli underworld is built around gangs run by the once poor sons of Middle Eastern Jewish, or Mizrahi, immigrant families: the Alperons, Abutbuls, Abergils, and others who have become household names in this country because of unflagging media attention. When Alperon was blown up, a TV crew a few blocks away was filming an episode of "The Arbitrator," a fictional series based on the nation's mafia.The largely Mizrahi crime families do most of their business in drugs, gambling, and extortion, with prostitution having been taken over by wayward immigrants from the former Soviet Union. Israeli Arabs have their own violent gangs known mainly for selling drugs and stolen weapons. Although ethnic separatism is the rule in Israeli organized crime, the lure of large, illicit profits can at times bring people of different backgrounds together.The mafia capital is Tel Aviv, but the gangs also operate in Jerusalem, Netanya, Bat Yam, Lod, and other cities, as well as in the prisons. They've gotten too big for police to control.The greatest obstacle for law enforcement is getting witnesses to testify; no wonder, since witnesses against Israeli mafia figures put their lives at risk. A couple of years ago, a prisoner due to testify against a crime boss was poisoned in his cell. A U.S.-style witness protection program is supposedly in the works to relocate such brave souls and give them new identities, but nothing has come of it. Yaakov Alperon now joins Felix Abutbul, Yaakov Abergil, Yehezkel Aslan, Gad Plum, and other reputed Israeli mob legends who were murdered, presumably by rivals. Yet, their killers are rarely brought to justice for want of witnesses and evidence. While the public doesn't grieve over the slain gangsters, the "collateral damage" is causing a growing outcry. The bombing of Alperon's car put a driver and schoolboy nearby in the hospital with minor injuries; in past mafia hits, innocent bystanders have been killed.After Alperon's murder, his wife, Ahuva, was on the TV news sobbing while his ex-convict brother Zalman, wearing a black yarmulke, swore that the family "was leaving revenge in God's hands." In times of crisis, Israeli mafia families typically turn to public displays of piety; a familiar scene on the evening news is of an accused gangster appearing in court in handcuffs and a yarmulke. Yaakov Alperon came from modest beginnings. He was one of 12 children who lived with their Egyptian immigrant parents in a two-room apartment in a dusty little town near Tel Aviv. He took up boxing, then put his fists to use on the streets and, soon, in prison. He was suspected of murdering rivals in and out of jail, but police could never prove it.Alperon, his brothers, and his henchmen brawled repeatedly with rival families; he made legions of enemies. One of them most likely activated the bomb that left him sprawled dead in a blasted, burning sedan in the middle of northern Tel Aviv. Now another score waits to be settled. 0 Response to "Yaakov Alperon, known as “Don Alperon”, said to run Tel Aviv’s third largest crime family.One of the leading figures in Israel’s mafia"